GRAPEFRUITCRAZY: Why did police use CS spray on Boots tax protesters? Why did police use CS spray on Boots tax protesters? Police in Britain today, generally speaking, maintain the respect of the populace. They do a difficult, often dangerous job, which for the most part they are underpaid. The occasions where officers fall short of the standards we expect of them hit the headlines. Thankfully such events are so rare that the contract between police and people remains firm. This is why I was disturbed by reports that police used CS spray yesterday on demonstrators at a Boots store in London’s Oxford Street, during a protest by anti-tax avoidance campaigners Uncut. 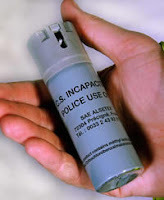 I don’t know the circumstances in which the spray was used (by the way the UK solution is five times the strength used by American cops). But from the press accounts the Home Office’s stipulation for the employment of such irritants might not have been met. “(A spray) is not intended to cause serious or life threatening injury. Rather, it should have sufficient effect to dissuade or prevent a potentially violent person from their intended course of action, and thereby neutralize the threat posed.” Without such violence in evidence, I wonder if economic pressures were. It takes four officers to tackle a protester who won’t move – more if they resist. It takes just one officer if a spray is employed. We face strikes, rallies, and marches in the spring when students and trade unionists combine to challenge the Coalition government’s spending cuts. There are likely to be extremists in their number hoping to turn peaceful demonstrations into riots. Police over-reaction could light the fuse. I worry that police forces, that are not immune to the cuts themselves, will be too tightly stretched when it comes to maintaining civil order. Officers might be under pressure to reach for their truncheons and CS sprays as a first resort rather than a last. Now I agree it is easy for me to take this line because I don’t have to face a furious mob yelling obscenities and in one instance, at least, prepared to drop a fire extinguisher from eight storeys in my direction. Our police need to have the subject of restraint high on their agenda when they come to reviewing their plans for crowd control. In turn they shouldn’t have to go out under-strength to enforce the rule of law. Overtime budget limits should be the first casualty of the likely coming confrontations. The protestors were engaged in doing criminal damage---ie trying to squeeze leaflets through the door apertures etc. Members of the staff of Boots had to treat the protestors for the effects of tear gas. You are not the only [ex?] journalist to be concerned about this incident.